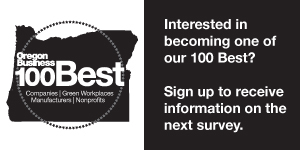 This year marks a special anniversary: We are celebrating 10 years of the 100 Best Nonprofits to Work For in Oregon survey. Congratulations to the organizations that made it into the decennial ranking of nonprofit workplaces with the happiest employees. And a special congratulations to Childpeace Montessori School and Ronald McDonald House Charities Oregon & SW Washington, which have been listed every year since we launched a decade ago. A more comprehensive version of this list, with a breakdown of scores and job site information, is available here.